The APT turned out to be more difficult than expected and was not going to give in easily, it took us another 3 days and 200km to reach the NW Coastal Highway near Sandfire Roadhouse. 10 Aug (Would have been my mum’s 103rd birthday today). The first 2 days were very slow going and we only managed 37 km today. We passed by a small gravel scrape filled with water. I didn’t have to go up the hill but I fetched a pail of water, but only to wash the windscreens with, it would not have been good enough to drink. Even after boiling, surface water is almost always contaminated by animal droppings. Here are the footprints of a large camel as he (or she) shuffled his (or her) feet to make a neat arrangement of droppings. The going was getting slightly easier but there were still very difficult sections requiring significant deviations from the track and knocking down small trees up to 3 cm thick where they became impenetrable. 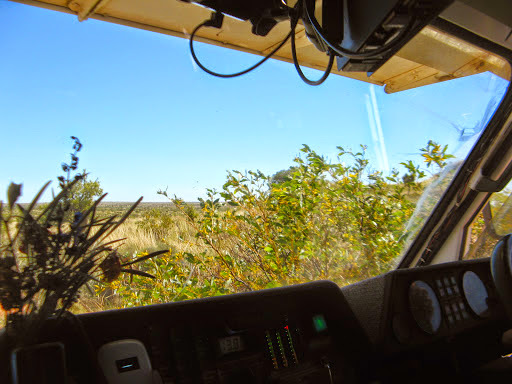 This deviation was needed around a seemingly straight and easy track section where we were confronted by a major thicket of Grevillia bushes and had to back up a few hundred meters and retreat to the slopes of a nearby sand dune where the bushes had thinned out. Burnt Holly Grevillea are the worst to push though, their black, stiff and scratchy branches tear at the outside of the Okas and their sharp hard roots are potentially very dangerous to tyres. Green living bushes, spinifex and trees were fairly easy to run over and polished the bottom of the Okas removing all oil drips, dirt, grime, wires, pipes and anything not securely bolted on or made of steel. 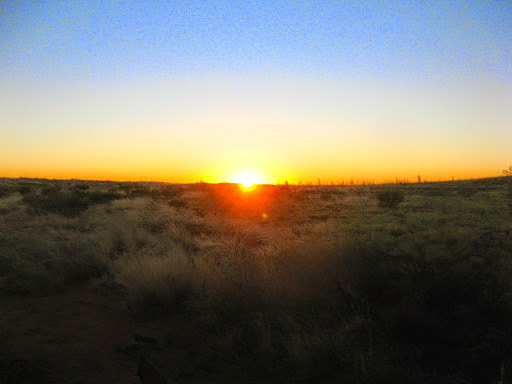 The most difficult terrain was irregular clumps of spinifex or tussock grass which covered the ground whenever we had to deviate around impenetrable thickets of small trees and often hid small termite mounds. They caused the Okas to bounce and roll alarmingly at even low speeds and put a tremendous strain on springs and suspension components, not to mention cupboards doors. 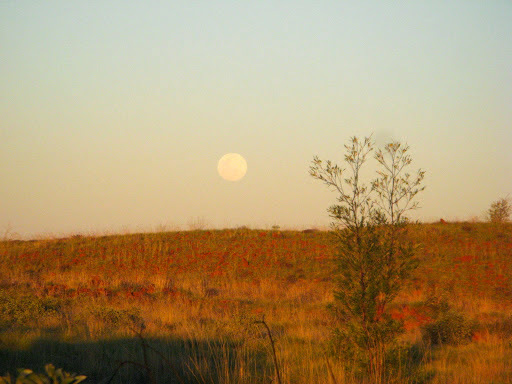 At the campsite that night, the full moon rose pink in the east just as the red sun was setting in the west. Spectacular, but we couldn’t work out how to get both in the one photo. We were approaching the end of our desert crossing now and achieved 57km today. 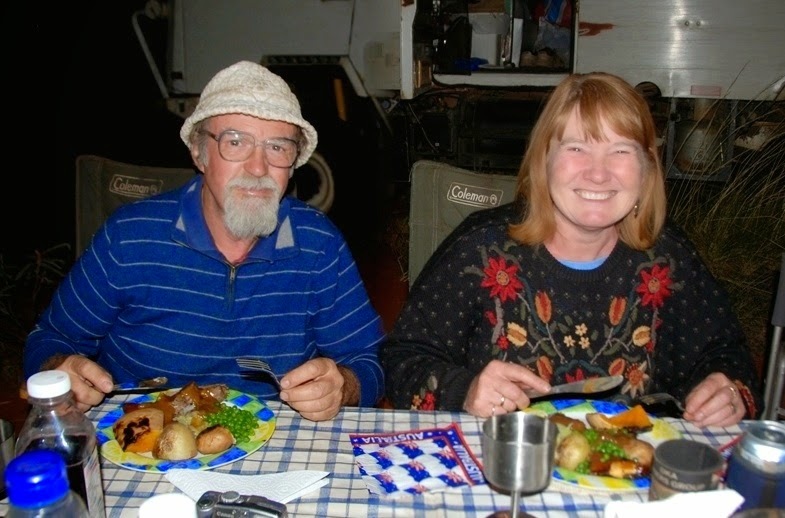 So for our final campsite on the track, Kaye cooked a superb roast lamb for all of us which we had with mint sauce. 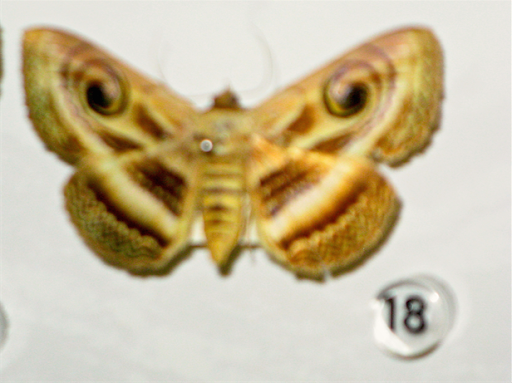 A brightly camouflaged moth had taken up residence in our kitchen. Eventually the going did get a bit easier as we headed west and we managed 133 km today to reached the NW Coastal Highway. 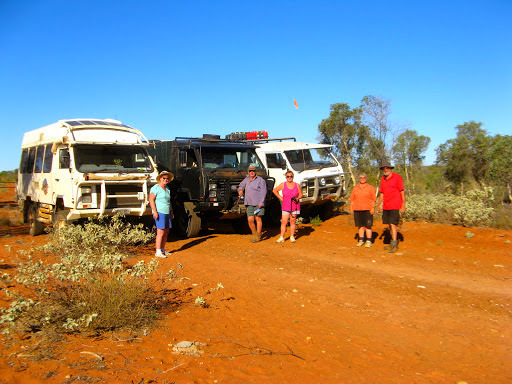 Finally the end of the desert track and into pastoral country, but we still had another 60km to go to the highway. Fortunately, track conditions improved somewhat as we approached the highway and all Okas made it with a bit of fuel to spare, in our case we were down to our last 10-15 litres after setting off with 300 litres. To do this we drained one tank and transferred it to the other side rather than have 2 tanks with only a few litres each. We had used over 95% of our fuel which was cutting things a bit fine. 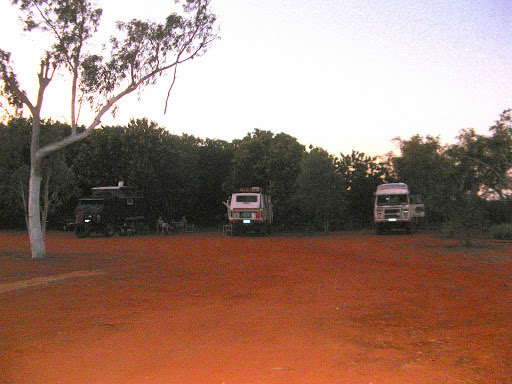 So with water and fuel tanks bordering on empty and only 1 useable spare tyre left between us, we arrived at Sandfire Roadhouse late in the afternoon, rather keen to locate their showers, washing machines and somewhere to eat. 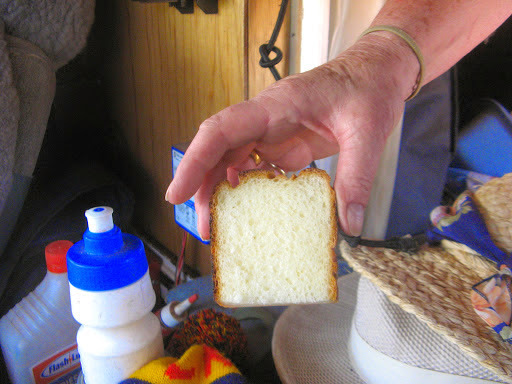 We had plenty of food left but after such a long arduous trek we just couldn’t be buggered to cook. After the essentials were done we ate out at the roadhouse “restaurant” and had rather a good dinner with wine to wash it down. However the work wasn’t quite done, Dave still had to arrange for 2 new tyres to be freighted up from Perth, which took a bit of organising seeing as we were around 2000km north of Perth. Several phone calls later and he had tracked some down and they would be on the next available truck. That gave us a day or so to wait so we took a lay day at Sandfire and did a lot of maintenance and repair. The lay day at Sandfire wasn’t as lazy as it could have been, there were tyres to fit and swap around, greasing to be done, various repairs to be completed as we all still had a very long way to go. And we took time to reflect on where we had been and what we had achieved. We had covered 700km of mostly trackless desert, but those 700km had taken 13 days, during which time we had met no one else, the 1969 Apollo 11 Moon Mission didn't take that long (only 9 days) and they didn't meet anyone else either. We had covered 700km of desert since leaving the highway near Fitzroy Crossing and reaching the coastal highway near Sandfire. Our average distance per day was only 48km at less than 10kph which was a lot slower than expected and made worse by the rocketing fuel consumption which averaged more than twice the normal rate, and was often higher. 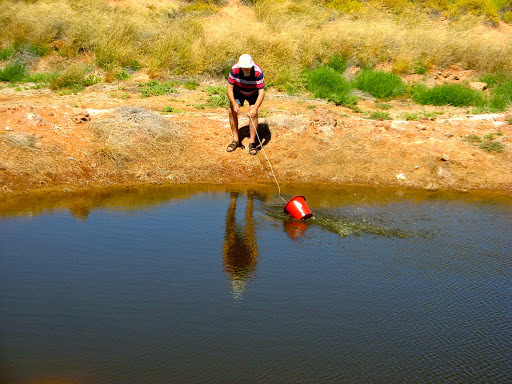 We also only found 2 sources of water in this distance so some frugality was necessary. Next time we will learn from this experience. But we had successfully achieved our 2 main objectives and were subsequently cheered(?) 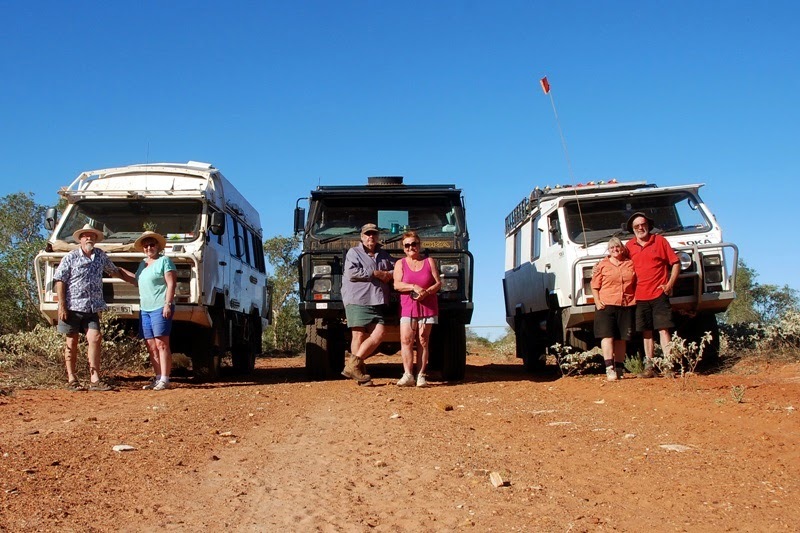 by the news that another similar expedition using smaller, nimbler 4WD vehicles had suffered even worse tyre problems than we did. 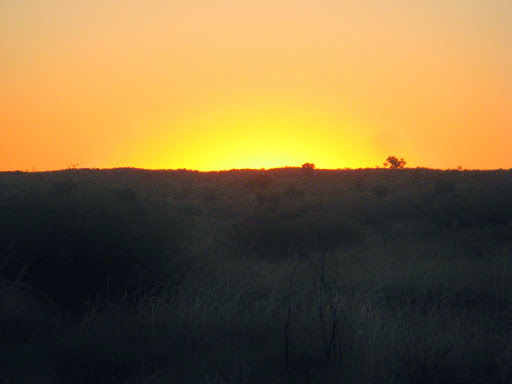 We had suffered no major mechanical failures and after a tough desert crossing, all three Okas arrived at their home paddocks many thousands of km further on, and spread across the country, with no subsequent problems. 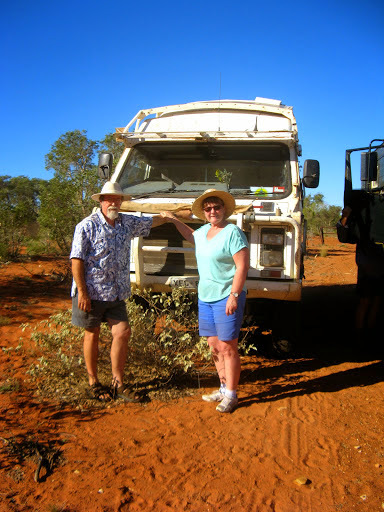 Our Okas had proved once again their strength and endurance, plus our travels had been in the relative comfort and security of larger vehicles. 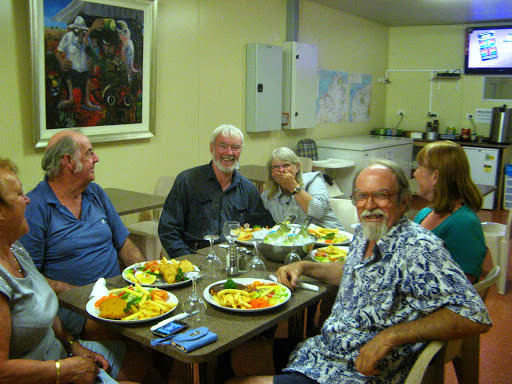 That evening we ate out again for the last supper in our best attire (comparatively). 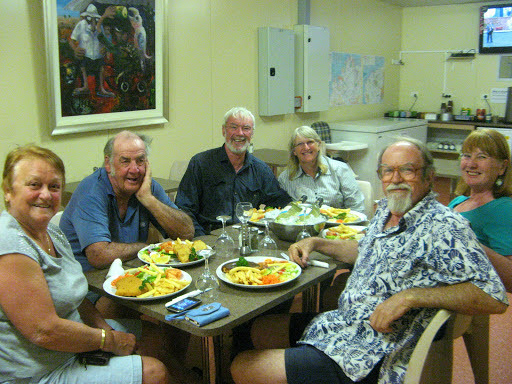 In mid morning we sadly said our good-byes to Dave, Pauline, Deano and Kaye at Sandfire to await the arrival of the new tyres, fuelled up with just enough expensive fuel to get to Broome and headed up the highway into a fierce headwind. 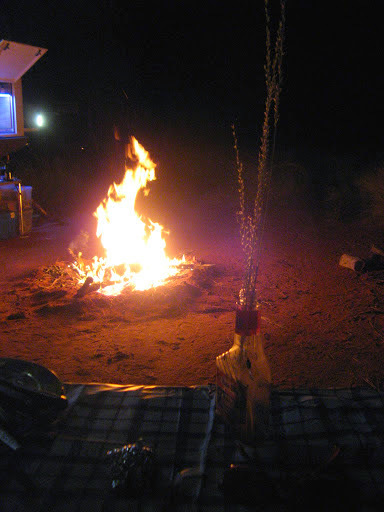 We camped at the Goldwire Rest Area near Barn Hill and had a quiet evening, the first for more than 2 weeks.